Chicago is host to an experience that invites the audience into situations that are not casually available all at once, if ever: the living room of a Muslim imam and his wife, a chilling townhall meeting, a passionate exchange between Muslim millennials, a mainstream Midwest suburban household conflicted by sympathies and ambitions. In playwright Jamil Khoury's characteristically ethnographic way, "Mosque Alert" at Silk Road Rising offers a matrix of possibilities, each raising questions and offering contrasting responses. With every turn of the prism, the theatre's Founding Artistic Director Khoury lays out disparate and authentically grounded perspectives, a formula he successfully employed in the acclaimed premiere of his "Precious Stones" in 2003, asserting the company's immortality two years after its official birth following the 9/11 attacks. A succession of rich creative collaborations has put Silk Road in league with Chicago's theatrical top brass, cornering the market on timely narratives with Asian and Middle Eastern themes. Employing expert performers and accredited directors has earned Silk Road a loyal and astute following. "Mosque Alert" in the seasoned hands of Edward Torres is no exception. Granted, even the play's college productions last year were destined to sparkle with lines like, "Can't we blame everything on Saudi Arabia and call it a day?" Khoury's talent for packing deep thought and learning into a night of good entertainment holds true to form. But it is the dexterous cast of this professional world premiere who make his play's one-for-me/one-for-you dynamic believable and compelling - performances that make a show of standard running time pass in a blink. Steve Silver's complete sublimation into the character of the charismatic bigot Daniel Baker leaves a welt. 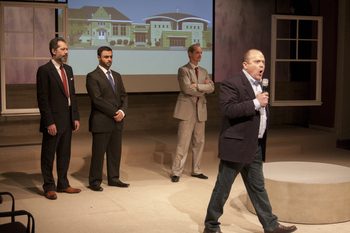 With echoes of the real Lower Manhattan controversy, the fictional plot involves a dispute over the construction of a mosque/library/community center in suburban Naperville. As a backdrop, designer Dan Stratton projects an architectural rendering created for "Mosque Alert" by America's go-to firm for mosque design, McCoy Architects. The action plays out with the proposed house of worship as the central figure, looking pert and posing contentedly in the realm of the possible. In typical Silk Road fashion, the ethnically colorful cast piques curiosity as to what the actors bring from their own political dispositions and cultural roots. Rengin Altay, who plays the white Christian wife of the chamber of commerce president, has Turkish ancestry, so all bets are off. Altay's easy command and comic sense benefit the whole. Owning her character's nuanced blend of integrity and compromise, she is convincing as a boozy housewife with aspirations. 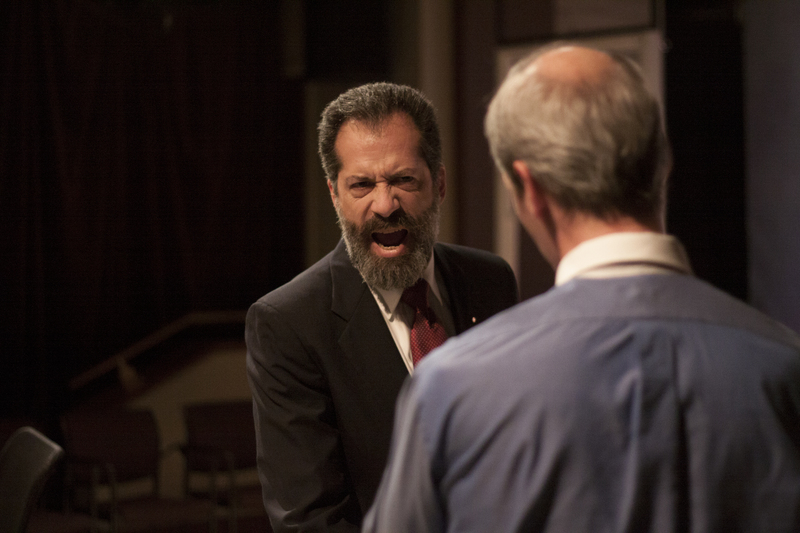 Rom Barkhordar is smooth and arresting as the elegant bearded Muslim business leader Tawfiq Qabbani whose relationship with Ted Baker (Mark Ulrich) develops through several masterfully performed scenes. 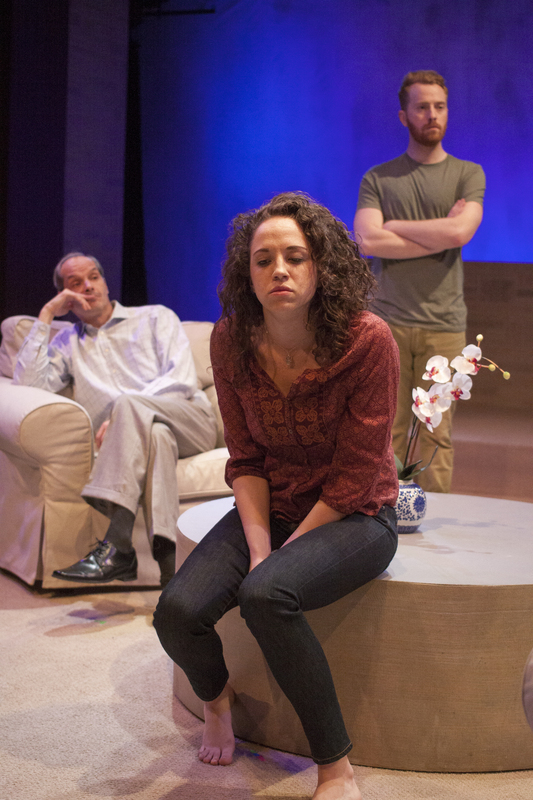 A gaggle of young suburbanites, the grown children of the couples in conflict, toss the ball sportingly with real-life Naperville native Nina Ganet's pitch-perfect generational stylings pulling it together in the role of Jennifer Baker. As the hopeful Imam Mostafa Khalil, Frank Sawa brings satisfaction with pronunciation of a significant amount of Arabic requiring no stretch of imagination. And Riley McIlveen plays the principled gay son of Ted Baker with sincerity. Leave it to Khoury to take a play about tensions of Middle Eastern origin and add a plot line about the struggle of homosexuality - then make it work. "Precious Stones" redux. 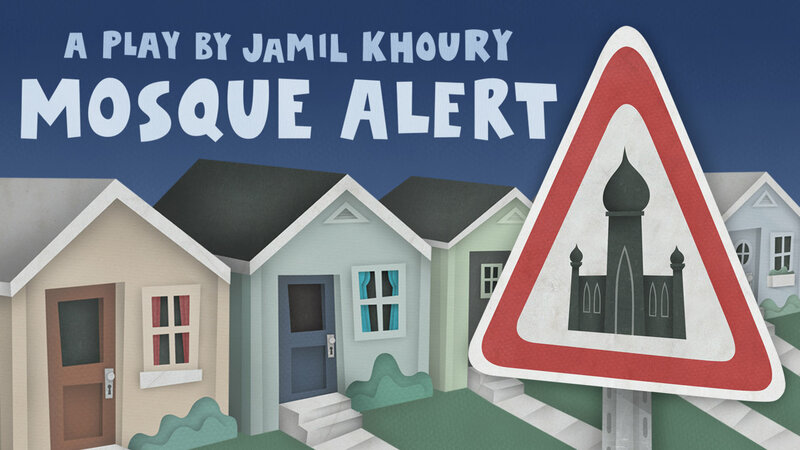 If "Mosque Alert" mimics the somewhat pat parallel structure seen in Khoury's earlier work, it also exhibits the same thoroughgoing treatment of issues that strike the bone for anyone following Middle East politics. Himself a non-Muslim Arab American of Syrian-Slavic descent, he treats the subject of Islam with a healthy remove, engaging a painstaking process of live and digital civic engagement launched in 2011. A series of videos inviting community feedback, staged readings with public discussions, workshops for re-writes, and experimental campus productions have led to the play's current iteration, with Knox College Professor of Theatre Neil Blackadder credited for incubating the full-length stage play. It bears mentioning that Silk Road Rising's Founding Executive Director Malik Gillani is Khoury's life partner and the son of South Asian Muslims. For him the decision to make "Mosque Alert" a centerpiece for 2016 was an obvious one. In light of presidential campaign rhetoric and Trump fervor, the zeitgeist speaks through this work. 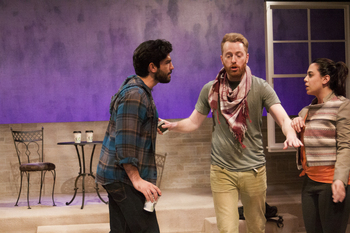 Gillani and Khoury have dedicated the current theatre season entirely to Arab-American and Muslim-American voices. The year of programming is entitled "Crescent and Star: A Radiant Season of Arab and Muslim Journeys." In contrast to the social climate in "Mosque Alert's" Naperville, President Shoaib Khadri of the existing Islamic Center of Naperville said during a post-show discussion, "The city council of Naperville was extremely supportive of our project."